Come this November 10, 2012, American Rock Band THE FRAY will be performing live in Manila at the Araneta Coliseum. The Fray is composed of Isaac Slade (pianist and vocalist), Joe King (guitarist and vocalist), Dave Welsh (guitarist) and Ben Wysocki (drummer). The Denver-based foursome formed in 2002 after high school friends Slade and King bumped into each other at a local guitar shop and has been known for their light-rock ballads & sprawling anthems. And let me just add, dramatic yet powerful music videos after watching some online just now. Six years since their massive breakthrough success of their debut record "How to Save a Life" in 2005, the band continued pumping sky-groping choruses and symphonic rushes. Followed by Grammy-nominated singles “Over My Head”, “How to Save a Life” , “You Found Me” and “Never Say Never. Slade shared his thoughts thru their website; "On our first record, we didn't quite trust ourselves yet. We loosened up on the second album, but there was still some element of restraint. But on this one, we just stepped up to plate and swung as hard as we could." With Slade’s co-founding member of The Fray, Joe King, collectively they achieved national success with their first single, "Over My Head (Cable Car)," which became a top ten hit in the U.S., and the release of their second single, "How to Save a Life," brought them worldwide fame. “How To Save a Life” was featured in the hit TV Series Grey’s Anatomy and Scrubs, making it one of the most played and widely recognized song in that 2006-2007. The song’s inspired lyrics came from an encounter Slade had with a boy with drug problems and realizing that all the boy need was support from his friends and family. “Never Say Never” also from their second album was featured in the movie Transformers 2: Revenge of the Fallen, allowing them to increase their loyal fan following worldwide. The band has also been nominated at the 2007 Grammy Awards for Best Pop Performance by a Duo or a Group and Best Rock Performance by a Duo or a Group. 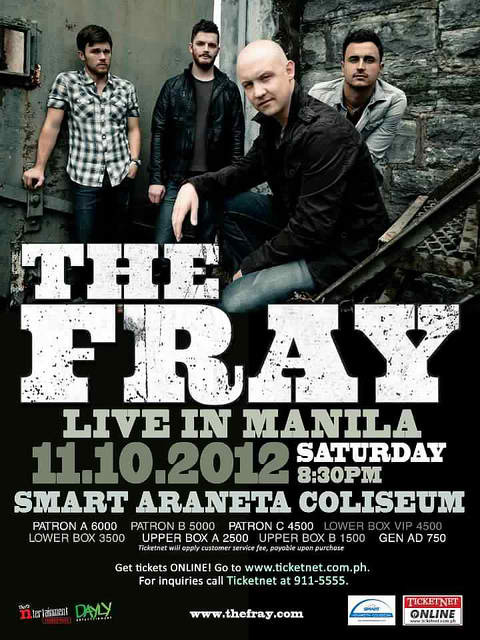 Tickets are available at Ticketnet or call 911 5555 for reservation.